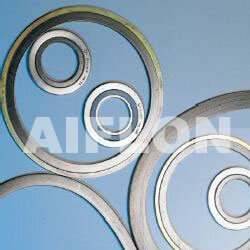 ﻿ Spiral Wound Gasket - China Spiral Wound Gasket Supplier,Factory - Cixi Aiflon Sealing Materials Co.,Ltd. Spiral wound gasket Aiflon spiral wound gasket (SWG) consists of a thin metallic strip and soft non-metallic filler that are simultaneously wound on a rotating mandrel. the metal hoop is pre-formed with a V or W shaped profile,which allows the gasket to act as a spring between the flanges. Further,the hoop provides the basic structural element for the gasket while the non-metal filler material seals small imperfections on the flange surfaces. depend on its excellent compression resilient, it¡ˉs suitable for sealing spots where the alteration of temperature and pressure are frequent,such as pipes,valve,pumps etc.they are available in all standard the flanges of sizes,e.g.ANSI,API,DIN,JIS,JPI,BS etc.